Back in the mid-90s, the Matchless DC/30 became one of the first boutique amps to hit the market. It excelled at clean tones, as well as thick Vox-like overdriven lead sounds. 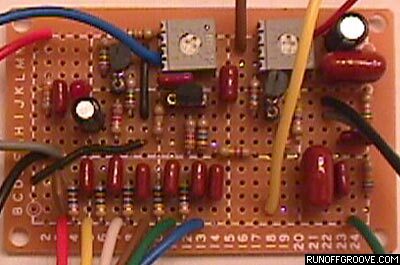 Try using a different MOSFET for the first stage. A 2N7000 sounded a bit "tighter" than a BS170. BS170 had a nice "loose" sound. 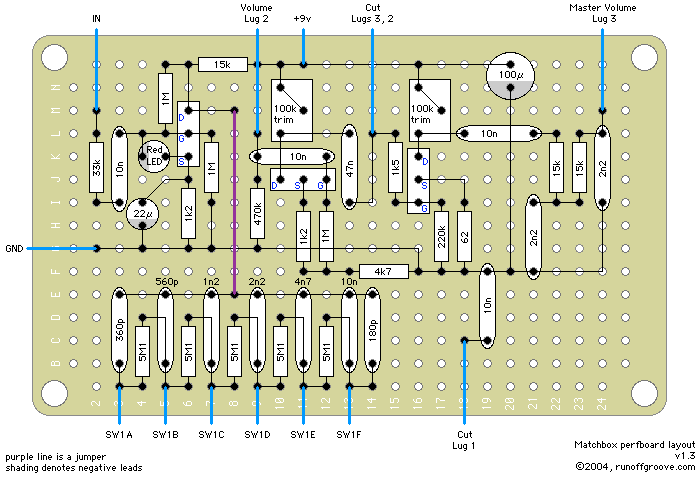 Any N-channel MOSFET can be used, but as always, pay close attention to the pinout. Try to use all metal film caps in this circuit. It really seems to add to the smoothness of the sound. Ceramic caps or "greenies" will work fine, but you will probably notice a bit more "grainy" sound. A 12v Zener diode can be used in place of the LED used for static protection of the MOSFET. You can use other JFETs, but be warned! The middle stage may not bias correctly or have enough gain to distort. Try other transistors at your own risk. 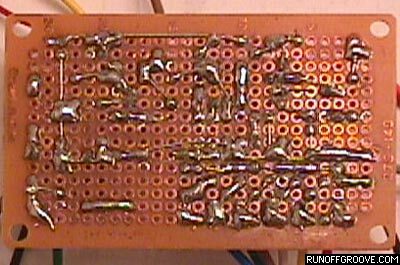 PLEASE do not post on Aron's Stompbox Forum with a complaint about the circuit does not working or sounding good when you do not use the specified components. You can always purchase J201 FETs from our friend, Steve Daniels at www.smallbearelec.com, who will ship to anywhere in the world. The official build used a Lorlin 2P6T rotary switch, Mouser Part #105-14572. On the back of the switch, there are letters and numbers by each solder lug. Wire terminal A to lug three of the Volume control. Wire terminals 1 to 6 to their respective nodes on the perfboard. Matchbox by runoffgroove.com is licensed under a Creative Commons Attribution-NonCommercial-ShareAlike 3.0 Unported License.